NEW YORK.- The Solomon R. Guggenheim Museum will officially mark the completion of its three-year restoration project with a ceremony officiated by New York City Mayor Michael R. Bloomberg, who will switch-on a site-specific illumination of the building created by artist Jenny Holzer and commissioned in honor of the restorations major benefactor Peter B. Lewis. 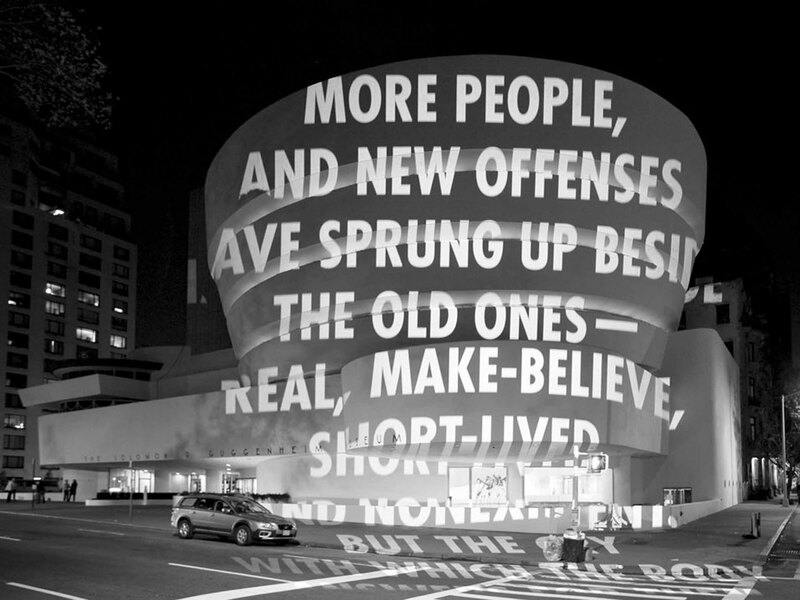 Holzers work, entitled, For the Guggenheim, will be a light projection onto the newly restored facade and will illuminate the exterior of the building every Friday evening, beginning September 26 through December 31, 2008, from dusk to 11 p.m., with a special additional showing on New Years Eve. The restoration of the Solomon R. Guggenheim Museum was made possible through the generous support of Peter B. Lewis, the Board of Trustees of the Solomon R. Guggenheim Foundation, and the Department of Cultural Affairs of the City of New York. Additional support was provided by the State of New York and MAPEI Corporation. In celebration of the restoration and as a tribute to Mr. Lewis, the Foundation commissioned artist Jenny Holzer to create a site-specific light projection for the facade of the museum. Her transformative work will cast large-scale textscomprising the artists own writings and numerous poemsdirectly onto Frank Lloyd Wrights curving architecture. Suffused with a play of light and changing language, the building and its surroundings will become an environment for looking, discussion, and gathering. The commission extends the museums substantial commitment to the artists work, established in her 1989 survey at the Solomon R. Guggenheim Museum and in works commissioned for the permanent collections of the Peggy Guggenheim Collection and Guggenheim Museum Bilbao. Holzer comments, "I am so happy that the Guggenheim has invited me to project on Wright's perfect building. It was an honor to hang text inside twenty years ago, and working with the museum's great face is the best possible return." Beginning September 2005 to July 2008, the Guggenheim Museum was enclosed in scaffolding while a team of architects, structural engineers, and conservators undertook a comprehensive condition assessment and restoration of Frank Lloyd Wright's landmark building in preparation for its 50th anniversary celebration in 2009. While in good structural condition, the building required the removal of 11 coats of paint, infilling of exterior cracks, treatment of corroded steel structures and repair and reinforcement of the concrete. For more than thirty years, Jenny Holzers incisive work has drawn on the explosive power of the written word. Incorporating strategies of mass-communication and the politics of public space, her street posters, LED displays, carved stone benches, and recent paintings tackle some of the most pressing issues of our time. Text-based light projections have been central to Holzers practice since 1996. Akin to credits rolling at the end of a film, the projected language allows her to work demonstratively with the ephemeral. Linking Holzers early street-based practice to her longstanding engagement with media and approaches common to the worlds of news and advertising, the projections have enabled the artist to continue to reach, surprise, and intrigue audiences. Holzers projections have taken place in four continents, fourteen countries, and more than thirty cities including Florence, Rome, Rio de Janeiro, Venice, Oslo, Buenos Aires, Berlin, Paris, Singapore, San Diego and New York City. From Mies van der Rohes Neue Nationalgalerie in Berlin and I.M. Peis Pyramide du Louvre in Paris, to the New York Public Library and Rockefeller Center in New York, Holzers light events have reimagined and paid tribute to iconic architectural spaces throughout the world.